Water plays a vital role in digestion, blood circulation, absorption of nutrients and the elimination of toxins. It's important in the function of every organ in your body, including the skin. Just like all other organs, the skin is made up of cells that require water to function. When your skin cells aren't sufficiently hydrated, the appearance of your skin suffers, making you look older than your years. Water has been scientifically proved to aid in weight-loss efforts. When you take in fewer calories than you burn over time, you lose weight. A study presented at the 2010 National Meeting of the American Chemical Society found that participants who drank two 8-ounce glasses of water before breakfast, lunch and dinner ended up consuming 75 to 90 fewer calories at each meal than the group that drank no extra water. After three months, the participants who drank more water lost an average of 4.5 pounds more than those who didn't. Water keeps things flowing in the body, aiding in the body's natural detoxification process. By increasing your body's hydration, you increase blood circulation, which helps the excretory system and lymphatic system get rid of toxins and whatever else isn't needed. According to a study published in "Alternative Therapies in Health and Medicine" in 2013, heart disease is the leading cause of death among firefighters, due to dehydration. When the body is insufficiently hydrated, cells of vital organs take water from the blood in order to function, thereby causing the blood to thicken. This puts pressure on the heart because it works harder to pump the blood. When your blood gets thick and water-deficient from organs pulling water from it, the blood in turn pulls water from skin cells, according to Dr. Richard Besser, the chief health and medical editor at ABC News. This causes your skin to look dry and your eyes to look darker and sunken. Over time, the condition can age you faster. When your skin is dry, it's less resilient and elastic, making it prone to wrinkling. If you're not feeling thirsty, however, it probably hasn't gotten to the point of dehydration that affects your skin, says Besser. 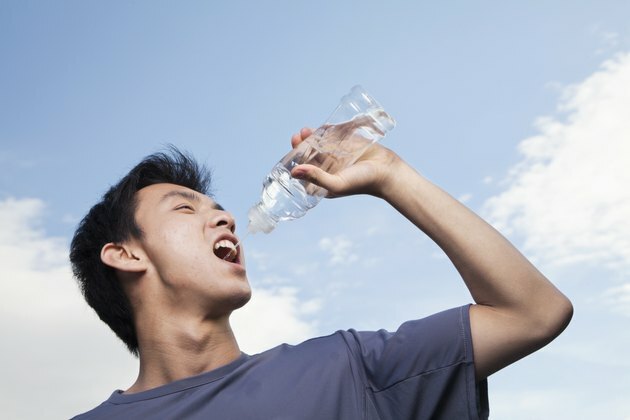 Experts generally suggest drinking between six and eight 8-ounce glasses of water every day. According to Cleveland Clinic, looking at the color of your urine can help you determine how much water you need. To stay healthy and hydrated, it should be a very pale yellow, like the color of straw. If it becomes completely clear, you may be drinking too much. If it's yellow, you need to drink a little more. ABC News: Can Drinking Water Really Take 10 Years Off Your Face? What Happens If You Don't Drink Water Like You're Supposed To? Can Liver Damage Cause Skin Discoloration?